With the movie coming out, I wanted to introduce my kids to the wonderful world of Charlie Brown. We spent a couple of afternoons with beach balls, balloons, newspaper and gobs of flour mixture - the perfect ingredients for a fun and messy time! A few black pipe cleaners fit the bill for Linus' hair. We used a couple of hangers and yellow felt for Sally's hair. We used black felt and rubber bands to create Lucy's hair. My daughter is wearing a dress in her closet that was perfect for Sally. We sewed Snoopy's costume out of white felt (drawstring pants and top, with a black spot and tail pinned to the back). We made Charlie Brown and Linus' shirts with a Michael's t-shirt and a sharpie. My daughter had the perfect Linus blanket. And Lucy's dress is my highschool uniform!! 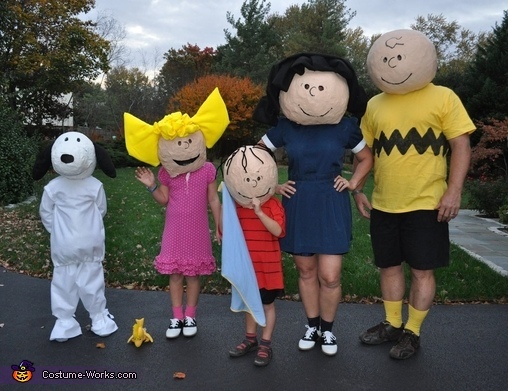 Kevin and Eileen as Charlie and Lucy, Abby (8) as Sally, Ryan (7) as Snoopy and Sophie (5) as Linus.